A Swiss eatery has bugs on the brain, and they’re hoping that patrons will bite. As Travel + Leisure reports, The Löscher restaurant in Switzerland's capital city, Bern, is now offering classes to instruct people how to cook with insects. Aside from the initial “ick” factor, insects are a sustainable, protein-packed food source, and cultures around the world—from Central Africa to Asia and Latin America—eat the tiny critters. To enjoy the taste of bugs, we need to rethink our relationship with them, Löscher’s manager, Andrea Staudacher, told Swiss news outlet 20 Minuten, according to The Local. “We associate prawns with food but not grasshoppers. However the two animals are very similar,” Staudacher said. Löscher’s next insect-based cooking class is on Monday, April 3. Staudacher will lead the event, and attendees will learn how to cook items including muffins and falafel using house-bred weevils, or flour worms, and fried grasshoppers. 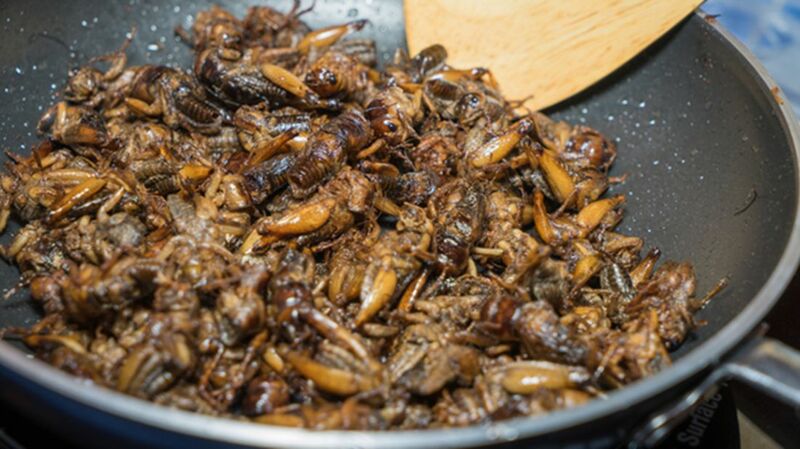 Chefs around the world have slowly—yet surely—embraced insects as a food ingredient, and it looks like the trend will soon become more widespread in Switzerland, thanks to new food safety regulations. Starting May 1, the Swiss federal food safety office will allow businesses to sell insect-based products to customers, so long as they follow standard food safety practices. One Swiss supermarket, Coop, plans to follow suit by selling foods like bug burgers and meatballs, and Staudacher may help popularize the creepy-crawly food trend among industry peers, as he’s already held a bug-cooking class for restaurateurs and chefs. Löscher’s insect-based culinary course costs around $80, and is available for 20 participants. More details are available here.